About the Sisseton-Wahpeton Band of Mississippi (Eastern Sioux): The Sissetons hunted, fished, and farmed along the Minnesota-Wisconsin border. The huge numbers of white settlers forced them into smaller areas, and the Minnesota Sioux War of 1862 forced the Sissetons to flee to Canada. On their return, the Tribe was forced to leave the Minnesota-Wisconsin area and settle on Lake Traverse and Devil’s Lake (now renamed Spirit Lake). History of the Reservation: The Sissetons, returning from Canada, signed a treaty in 1863 at Enemy Swim Lake. This treaty authorized the Reservation, which was established in 1867. Initially, the Reservation encompassed 1 million acres. Subsequent allotments awarded 300,000 acres to the 2,700 tribal members, and the remaining 700,000 acres were purchased for non-Indian settlement. The Reservation currently occupies 107,200 acres. 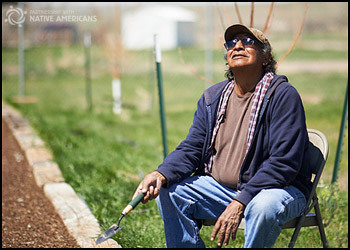 Life on the Reservation: The Reservation’s economy relies on farming, ranching, casinos and small industry. Individuals raise cattle, sheep, horses, and hogs, while the Tribe leases land to others for crop production and grazing. The Tribe owns and operates two casinos, which employ 500 people, and a business that manufactures plastic bags, which employs 35 people. Despite these businesses there are few other available jobs and one quarter of Lake Traverse tribal residents are unemployed. Tribal members earn on average only $4,058 per year. Lake Traverse on the map: Roberts, Day, Dodington, Marshall, and Grant counties in northeastern South Dakota; Sargent and Richland counties in southeastern North Dakota.